Charlie Blackmon could be a sleeper next season if the Rox move bodies. Heading into the 2012 season, we weren’t sure what to make of Hiroki Kuroda’s chances of success moving from the Dodgers to the Yankees. We assumed he’d get more run support, translating into more wins, but also expected him to suffer in every other statistical measurement. The dude was 37 before the season started and given that he was moving from a weak division to one of the toughest in the game (not to mention a nice hitter’s park for half his starts), we thought that as long as he didn’t backslide too much, it would be a victory. The upshot was that we considered Kuroda as someone just inside the top 50 in our Starting Pitcher Rankings. So how’d we do in our assessment? Well, we nailed that whole wins total thingy but, surprisingly, many more of Kuroda’s numbers also headed north and he wound up as a top 20 pitcher by season’s end. Still, even so, we did wonder in an early October Podcast whether Kuroda was a good enough No. 2 starter for the Yankees to make a deep run in the playoffs. Yup, we were off there, too, as New York made it to the ALCS and Kuroda was stellar in beating the Orioles in Game Three of the ALDS before tossing another solid effort against the Tigers in Game Two of the ALCS, but not getting any run support. Kuroda re-upped with the Yanks – for apparently less money and fewer years than he could have gotten elsewhere – as part of the New York’s winter of status quo, which also saw the team re-sign Andy Pettitte and Mariano Rivera. That ensures the team’s pitching will be the same as last year, but what about their holes on offense? Well, that’s another story for another day. Back to our topic at hand. Obviously, Kuroda was pretty thrilled with his Big Apple experience to stick with the team when better offers existed (not that $15 million for one year will have him clipping Kraft Dinner coupons). He can also earn close to a million extra clams in incentive bonuses. This season, his hit rate bounced back slightly, he somehow managed to slightly trim his home run rate (despite a career worst in HR/FB ratio and a tougher home park) and he enjoyed career bests in wins and strikeouts. While Kuroda’s ERA was up slightly, his OPS against actually dropped. Clearly, Yankee Stadium was not an issue for Kuroda. In fact, he excelled there, going 11-6 with a .219 BAA and 2.72 ERA at home compared to 5-5, .292, 4.23 on the road. He was also a drastically better pitcher during the day (1.99 ERA) compared to night games. The right-handed Kuroda’s righty/lefty splits were right around what you’d expect and his performance on a month to month basis was fairly consistent with June being by far his best showing and September being by far his worst (which nearly helped the Yanks cough up their big AL East lead). Thanks to fine showings in both August and October, his second half numbers were better (3.14 ERA compared to 3.50 first half). Kuroda was at his best with runners on base, but if the bases were loaded, look out. He did not fare well in those situations (in a small sample size, naturally). The interesting thing about Kuroda’s game this year was that he shied away from the fastball more than ever, increasing his reliance on his curveball and especially his slider. It was certainly a formula that worked in his transition to the American League, so let’s hope we see more of it next year. So, what can we expect in 2013? Kuroda is on his way to Club 40, but he’s not showing signs of age yet, so consider him a very dependable Fantasy option. His Ks and wins will likely decline, while his ERA keeps creeping up, but there’s no reason he won’t again be a top 30 starting pitcher. Colorado Rockies’ flyhawk Charlie Blackmon came in 135th in our pre-season Outfield Rankings and while he definitely showed improvement, a turf toe woe prohibited him from really showing what he can do. However, Blackmon let loose in the Dominican Winter League, winding up sixth in the league in batting before heading back home. 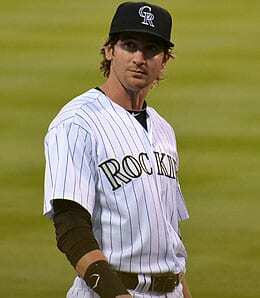 Colorado’s fourth round pick in 2008 currently projects as the fourth outfielder, but winter wheelings and dealings could open up a starting job for him. Blackmon has sleeper potential, so it’s worth considering how much PT he’ll get next year. In October, the Brewers outrighted Livan Hernandez off their roster and he became a free agent after refusing the assignment to the minors. Is he done? Hernandez is now 37 and coming off his 17th big league season. Now strictly a reliever, he was tagged around with the Braves before they released him. In June, he joined the Brewers and served up a shocking 10 homers in just 36 1/3 IP. We can’t see someone else taking a chance on him, but then again, who knows? Some players are like cockroaches and just can’t seem to be killed. This entry was posted on Wednesday, December 5th, 2012 at 12:56 pm	and is filed under BASEBALL, Fantasy Notes, Player profile, RotoRob. You can follow any responses to this entry through the RSS 2.0 feed. Responses are currently closed, but you can trackback from your own site.